Book Nook Inn's pond is stocked with Bass, perch and catfish. They are usually plentiful and easily caught, if they're in the mood to play with you. Since the pond is on private land, no license is required. We also have a few fishing poles available to rent at $5.00 a day. 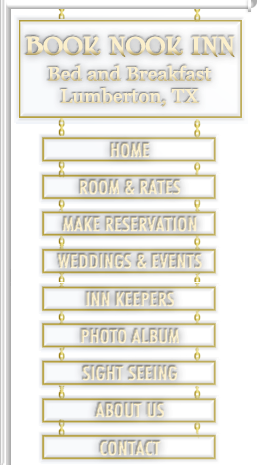 Reserve time at Book Nook Inn for your upcoming meetings, family reunions, book release parties, bridal showers, weddings, family get-togethers, office parties or whatever. A great place for business team building or a productive get-together for your organization.